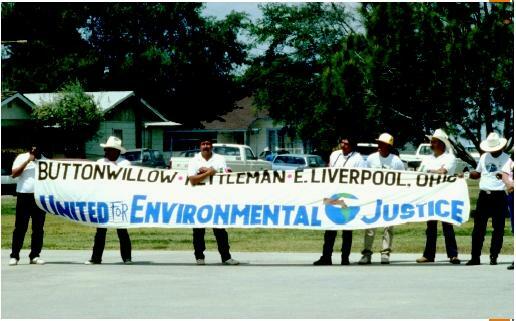 A rally before the march to Laidlaw dump in Buttonwillow, California. policymaking, the enforcement of laws, and targeting communities of color for disposal sites and polluting industries. SEE ALSO A CTIVISM ; E ARTH S UMMIT ; G AULEY B RIDGE , W EST V IRGINIA ; P OVERTY ; W ARREN C OUNTY , N ORTH C AROLINA ; Y UCCA M OUNTAIN . Environmental Justice Resource Center Web site. Available from http://www.ejrc.cau.edu . U.S. Environmental Protection Agency Web site. Available from http://www.epa.gov/swerosps . Did you know that the Air Force is planning to ship soil contaminated with Ra-226 to Buttonwillow from former McClellan Air Force Base in Sacramento. Apparently, waste from oil fields containing elevated levels or Radium are already being shipped to Buttonwillow and now the Air Force has found that their contaminated waste also fits under the permit conditions issued to the Buttonwillow site by Kern County. Radium 226 has a long half life of thousands of years...so it will be around for awhile.